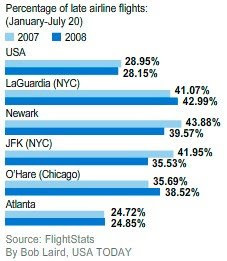 Across the nation, 72% of flights arrived on time through July 20, less than 1 percentage point better than the same period in 2007. Congestion in the New York region, which causes three-quarters of delays across the USA, remains formidable. Barely six flights in 10 have arrived on time this year at New York's three major airports, according to FlightStats, which tracks flights. These statistics do not take into account those flight deliberately delayed by the United Airlines Pilot Union.